Proposals can be difficult, if you’d like to find somewhere special to ‘pop the question’ in Edinburgh we have just the guide! 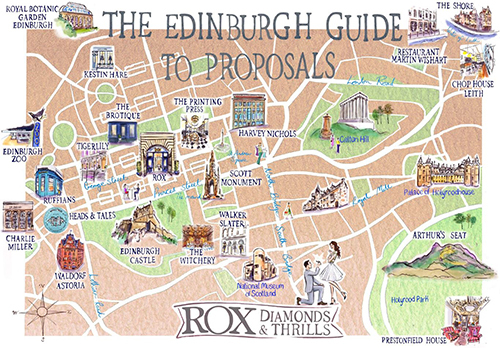 ROX – Diamonds & Thrills’ Edinburgh Guide to Proposals is a map for jus where to go when you want to ask the big question. To top it all off it also has a guide on how then look & feel fantastic on your wedding day. We’ve teamed up with ROX the award-winning George Street jeweller. The guide guide highlights some of Edinburgh’s finespropost locations to help you, your bride and your bridal party from proposal day right through to your wedding day. Enjoy your special day from start to finish with our experienced stylists, who will provide you with the highest standards of care and attention. 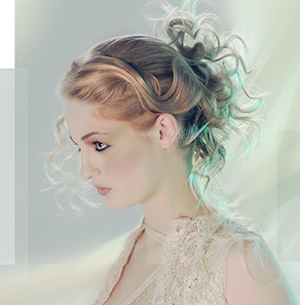 Many of our award-winning stylists specialise in bridal hair where the constant focus is looking after you. During your trial and wedding day appointments the Charlie Miller team will cater to your every need with a caring heart whilst creating the perfect style for your big day. From cutting, colouring and highlighting to intricate put-ups, your priorities are ours as we create the image you desire, either in salon or at your preferred location. Find out more by visiting your nearest Charlie Miller salon, talk to our talented team and experience the difference for yourself.